There’s always important dates to remember. We will diarise key dates that are important for the online filing and submission of your accounting/payroll data and we will send you a gentle reminder of these key dates. We personally feel that it is better to receive a reminder from us, rather than a fine from the Tax Man. Fines usually involve a large penalty, followed by daily interest charges so it is essential that your paperwork is filed correctly and on time. That’s why we will email you regarding your VAT/Yearly Returns to ensure that you don’t miss an important deadline. By working with us you will free up your time to focus on your core business activities. January 19th PAYE December PAYE and NIC payment for December to be with the Inland Revenue. 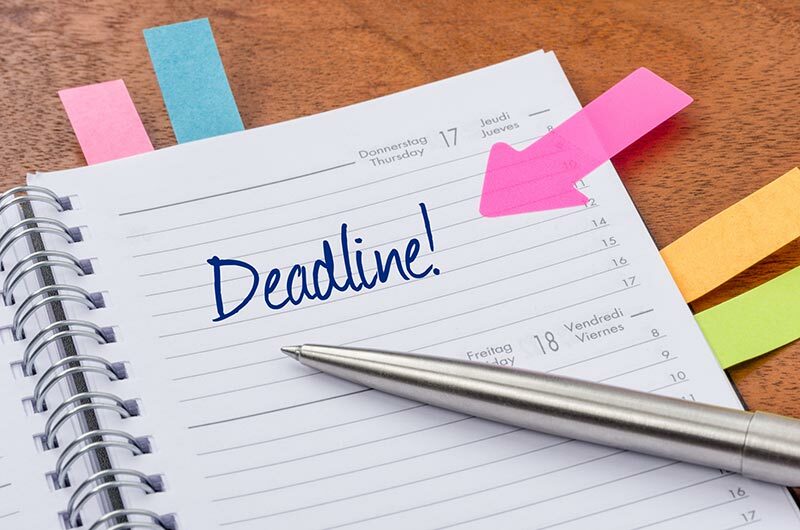 31st Self Assessment Tax Return Deadline This is the final day to submit your Self Assessment Tax Return (online) with the Inland Revenue (for the previous tax year) in order to avoid the £100 penalty. February 19th PAYE January PAYE and NIC payment for January to be with the Inland Revenue. 28th If you still haven't paid the balancing payment due by 31 January, you'll be charged an automatic 5% surcharge on top of the amount you still owe. This is in addition to any interest payments. March 19th PAYE February PAYE and NIC payment for February to be with the Inland Revenue. 19th PAYE March PAYE and NIC payment for March to be with the Inland Revenue. 31st P60 Revenue Forms P60 to be distributed to all employees by this date. July 6th P11D Forms P11d must be with employees by the 6th. 31st Making payments on account This is the deadline for making a second payment on account for any tax owing for the previous tax year. If you still owe tax that you were due to pay by the previous 31 January, you'll be charged a second automatic 5% surcharge on top of the amount you owe. August 19th PAYE July PAYE and NIC payment for July to be with the Inland Revenue. September 19th PAYE August PAYE and NIC payment for August to be with the Inland Revenue. October 19th PAYE September PAYE and NIC payment for September to be with the Inland Revenue. 31st Self Assessment Return IR tax calculation (paper) Last date for your SA return to be with the Inland Revenue if you want them to calculate your tax liability. November 19th PAYE October PAYE and NIC payment for October to be with the Inland Revenue. December 19th PAYE November PAYE and NIC payment for November to be with the Inland Revenue.